In a small, bowl stir together the flour and salt. Set aside. In the bowl of a standing mixer, cream the butter and sugar, about 2-3 minutes. Add the egg yolks and vanilla and mix until combined. With the mixer on low, add the flour mixture. Mix until it forms a soft dough. Transfer the dough on to a lightly floured surface. Shape in to square and divide it in half. Transfer each half to a sheet of plastic wrap. Wrap tightly and refrigerate for at least 30 minutes. Unwrap one half of the dough and place on a piece of lightly floured parchment paper. Cover with a sheet plastic wrap and roll the dough to 1/4-inch thickness, about 10"x8" rectangle. Remove the plastic wrap. Using an off-set spatula, spread half (1/4 cup) Nutella on to the dough leaving a 1/4-inch edge all around. Using the parchment as a guide, roll the dough starting from the longest side, in to a tight log. Wrap the parchment around the log and refrigerate for at least 30 minutes or freeze for 15 minutes. Repeat with the remaining half. Unwrap the log and slice into approximately 1/3-inch slices. 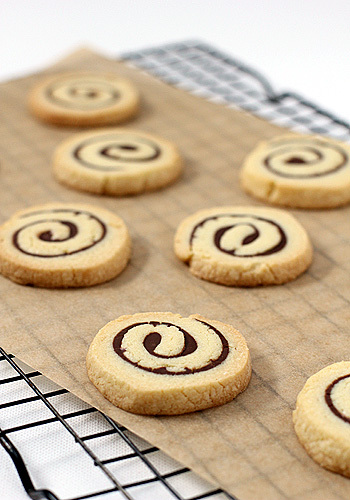 Place the slices on the prepared baking sheet 1-2" apart (I can fit 15 cookies on a 12x15-inch baking sheet). Bake for 12-15 minutes or until just golden around the edges. Remove from the oven and cool on the baking sheet for 2 minutes. Remove the cookies to a wire rack to cool completely. Store cookies in an airtight container for 1 week. Enjoy! Those are addictive cookies! Just to die for. Those spinwheels are so lovely! My daughter is a nutella lover and will love these cookies for sure! One question, what do you use to slice the cookies to keep the shape? Wüsthof Grand Prix Santoku, but any sharp knife will work. I have never tried Nutella but these look so yummy I think I'm going to bake them for a holiday cookie exchange. Thanks for sharing! Oh my goodness those pinwheels look so precious! Love the Nutella filling! I wouldn't be able to resist it! I can't believe how perfect these look! The nutella filling sounds great! Oh, thank you for all the kind comments! I do appreciate you all stopping by. Holy moly - those look fanTASTIC! Totally going to make these very, very soon! I've got them in the oven right now. If they are as yummy as the dough, I'm in trouble! Yeah, I am pleased that you are giving them a go! Your pictures are gorgeous. 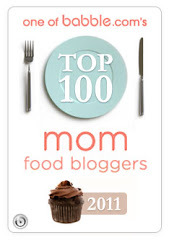 I'm adding your blog to my Google Reader so I can get more ideas from you! These look like a cookie I would love. In fact, I may go get a spoonful of Nutella right now. These are perfect! I'm bookmarking this recipe for this weekend. These look amazing! Did you have any problems with getting the dough to roll into a log? I'm making mine right now and my dough keeps breaking when I'm trying to roll it. Couple of questions--how long has your cookie dough been in the refrigerator/freezer? And are you scooping the flour into the measuring cup or packing it? The breakage could be that the dough is too cold to roll or that you have used too much flour. I made these cookies for a cookie exchange. 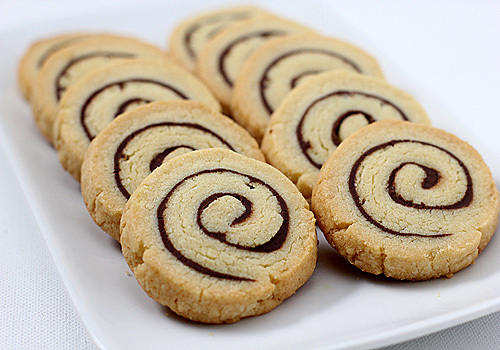 I'd never made a roll cookie before, but I couldn't be happier with the way they turned out. They looked just like the pictures. I made a double batch and put one log in the freezer for Christmas. I will definitely make them again! Thanks for letting me know how they turned out! My husband will absolutely LOVE these! Great post! I made these last week. Nutella is one of my daughter's food groups, so we obviously had to give them a try. We all loved them. I loved that the cookie wasn't overly sweet. In fact I upped the salt to 1/2 a tsp b/c I love the salty/sweet thing. They were absolutely delish & gorgeous to look at! I am so glad you and your family enjoyed them. Thanks for letting me know. Lots of beneficial reading here, thanks! I had been searching on yahoo when I discovered your publish, I’m going to add your feed to Google Reader, I look forward to far more from you. You are welcome! I am glad you enjoyed the cookies:) Thank you for letting me know. I made these today to take with me to my performance at Gallery Night tonight. They're not nearly as pretty as yours (in fact, they're kinda lumpy looking) but they taste delicious! I am thrilled you made the cookies for your Gallery Night. Thank you for letting me know:) Best wishes on your performance! I made these tonight with homemade nutella I had made prior, for a dinner with my mother in law, they were a real hit! They took some fussing (when rolling) but turned out just like in the picture! Thank you, it was well worth the effort! So pleased you had good results! Just wondering, were these cookies soft or on the crunchier side? They have the texture of a tender shortbread. I found this on pinterest and they look yummy! Would it be okay if I divided the recipe in half? I made these and they turned out to be an absolute hit! Will be making them again tomorrow :) Just in time for Christmas!